Just as we love to take in all of the elements traveling the open road have to offer, a lot of that enjoyment stems from sharing those experiences and inspiring you to get outside yourself. Here are some travel resources we hope will help you plan your adventures as well as guide you out on the trails. Preparing for Multi-Day Desert Hikes. 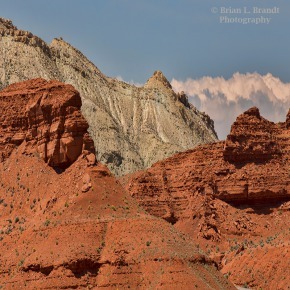 Looking to go hiking in the deserts of lower Utah; or maybe those of Nevada? Or even some of the hot areas of Wyoming or eastern Oregon? Spend a few minutes with our 10 tips to help make your expedition a successful one. You may have guessed, but the best time for beginners to frolic about the desert is early Spring: either early- or mid-March depending on the predicted weather, of course. Early Fall is also a great time to see fall colors: September. Keep in mind that the desert, like anywhere, can get very cold after sunset; so much so that hypothermia can be a real danger. Be sure to pack the appropriate gear to keep yourself warm during the night and cool during the day. Safety is a priority when doing any trip; a good hiking buddy can be the key to getting out of whatever rut you may be stuck in... 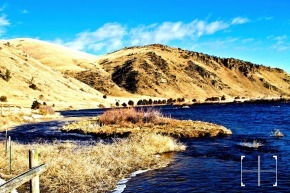 Cell phone service is spotty to non-existent in these remote areas. Costco is your friend. And don't be afraid to buy enough to have a stash of heat-resistant snacks (and of course, lots of extra water) in the car for when you get back after hiking. If the area you are exploring is without trails and uncharted, don't under-estimate the importance of building your own guide-post cairns; especially while traveling through the winding gulches which can be easily disorienting. Be sure to knock them down as you return; Leave No Trace principles apply here as in all back country. When hiking the sandy dunes or many lake beds, keep in mind you have to schlep all your gear about with you. Bringing less is better as long as you know and pack the essentials, especially water. For example, a compass is always a good thing to have. Don't over-pack! Soon enough if not already, you'll learn that packing extra batteries is always a good thing. They will really easily fit at the bottom of your pack. Now you may be thinking "we're not going to take that many photos"---simply put, you'll surprise yourself, especially in places like Zion or Arches where there's a post card waiting every 20 feet. Even though batteries and electronics are getting better, after a day and a half hike through the sun and 250 photos later; you'll be surprised to see only a quarter battery left to use over the next two days of the trip. Good thing you packed extra! And take extra batteries for your headlamp too -- you may find yourself wanting to do more hiking in the cooler dark than you originally estimated, especially if you're on the way out and low on water. 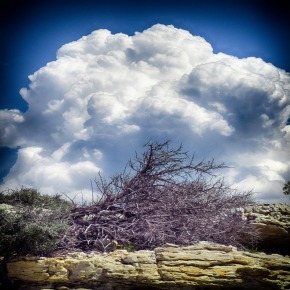 We recently bought a guide book for a hike in the hot, dry country of the Bighorn Canyon National Recreation Area in Wyoming from their visitor's center. The book described what we were about to tackle as an 1.8 mile round trip with 250 feet of elevation gain. We went out with appropriate water and expectations, only to find the guide book was dead wrong -- it was over 2 miles ONE WAY -- and 1,300 feet of elevation gain. We forged ahead for a while, but finally just turned around in the face of the fact that we were getting dehydrated enough to be concerned. After we got back to "4G" territory, we looked at a couple alternate internet sites and found out "The Truth" about the distance and conditions. Any hotter, or any more stubborn, and it wouldn't have been pretty. Weather miles away from your hike can have disastrous results. Rain from nearby mountains roaring down the canyons in the lower desert has killed many a hiker. So be aware! Often, good desert hikes start at the end of long dirt roads. Have a spare tire, check it before you leave, and know how to change a flat. And double-check your jack and jack handle (horrifying stories abound of having a jack and no handle) , know how and where to place the jack under the car or truck, and be sure to "chock" the tires that aren't flat with big rocks so your rig doesn't slide forward or backward off the jack. #9. Weather You Can't See Can Kill You In 2015, 16 people died in slot canyons in Utah from storms that were miles away and far out of sight. Craig Childs has written an excellent book on these kinds of deadly flash floods called "The Desert Cries" and another engrossing book on the desert and water called "The Secret Knowledge of Water." We have both read and highly recommend them before you start out on your desert exploration. Carbon Water filter (with a hand-pump) - This is absolutely,100% essential. The still and stale water you may find throughout the desert is a sure way to get sick if you don't filter it. I'd even go as far as to recommend a hand-pump, because then you don't have to worry about electronics; only your own clumsiness. Make sure to get a high-grade carbon filter to keep out those pesky bacteria. Small hiking Headlamp - If on one of your day hikes you miscalculate the time it takes to get back to your camp, you may very well find yourself walking in the dark searching for your camping spot. Furthermore, it is a nicety when you're trying to set up your miniature propane camp-stove and other things after a long day of hiking. Pack extra batteries. GPS System - Many desert canyon areas are very convoluted; trails can disappear in high wind and flash floods, and after crossing two- or three nearly identical ridges, you can become disoriented. Take a GPS and know how to translate what it's telling you to a topo map of the area. A towel … is about the most massively useful thing an interstellar hitch hiker can have. Partly it has great practical value — you can wrap it around you for warmth … More importantly, a towel has immense psychological value. For some reason, if a strag (strag: nonhitchhiker) discovers that a hitchhiker has his towel with him, he will automatically assume that he is also in possession of a toothbrush, washcloth, soap, tin of biscuits, flask, compass, map, ball of string, gnat spray, wet-weather gear, space suit etc., etc. Furthermore, the strag will then happily lend the hitchhiker any of these or a dozen other items that the hitchhiker might have accidentally "lost." 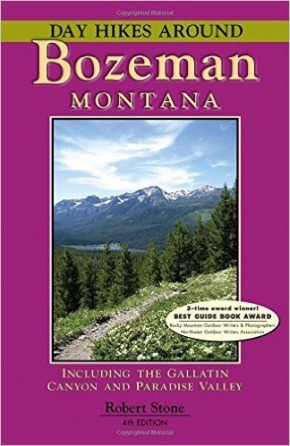 From the Introduction — “A drive across South Dakota reveals a variety of landscapes, from the spectacular granite spires of the higher Black Hills and the concentric hogback ridges that encircle them to the precipitous Badlands, the rolling prairies, and the deep trench of the Missouri River. 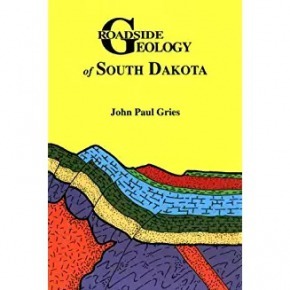 Farther east are the more subtle landforms left by the melting glaciers of 10,000 or so years ago.” This book guides you, highway by highway, through that geologic state. The only guide to these plants, fully illustrated with color photographs. A must if you plan to harvest and eat any of these. Interesting vignettes arranged by highway traveled. 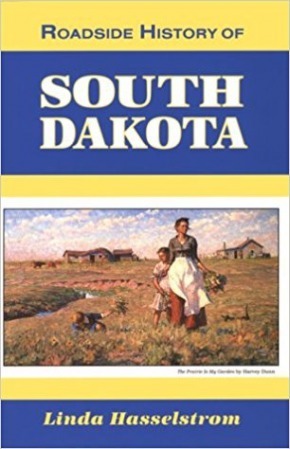 Stories of Native Americans, European settlers, women, miners, soldiers, ranchers, farmers — the human history of South Dakota. 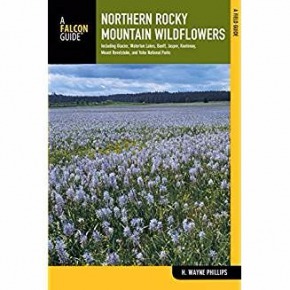 Northern Rocky Mountain Wildflowers: including Glacier, Waterton Lakes, Banff, Jasper, Kootenay, Mount Revelstoke, and Yoho National Parks. 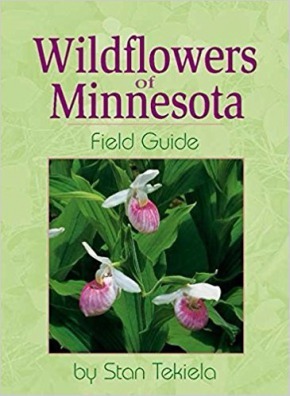 This field guide features more than 300 species of wildflower and shrubs. The clear photos of the plants are arranged by flower color, and the book is indexed by common and scientific names. Each entry includes a description, bloom season, habitat and range, and comments on such things as name changes, medicinal uses, and other information. The book's introduction covers the geography, climate, soil, and vegetation of the areas as well as plant characteristics used by botanists to identify plants. The author is a former ecologist, range manager and forester with the forest service. The binding is strong and will serve well in the field. This guide covers over 700 primary species and over 300 secondary species of native and naturalized plants in 115 families. 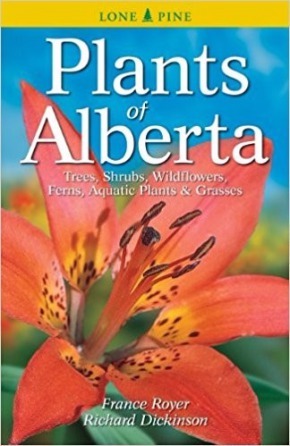 The introduction describes the eco-regions of Alberta and best wildflower viewing sites. The guide is arranged by plant type (shrubs and woody vines, trees, etc.) and then sub-divided by plant family (pine, willow, spruce, etc.). Each Type section starts with a key in which small photos of the plants are arranged by color and subdivided into characteristics such as number of flower petals. The sections have larger photos, descriptions, and range maps for each plant. An illustrated glossary of plant terms and extensive bibliography complete the book. The binding is sturdy and will last well in the field. This small field guide has full page photos of each plant and is arranged by flower color. The descriptions include family, height, flower, leaf, fruit, bloom, cycle/origin, habitat, range, and author's notes. The index has only common names. This author has a series of these small guides for mammals, birds of prey, etc. in areas throughout the Midwest. They are great beginner books. 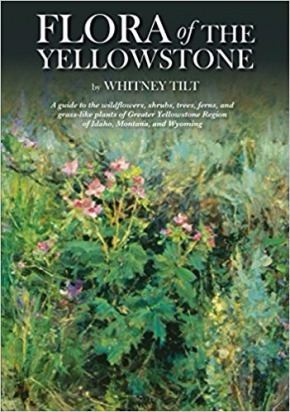 "Included here are more than 400 wildflowers, grasses, shrubs and trees readily found in the Greater Yellowstone Region, including Yellowstone and Grand Teton National Parks. Designed for easy use, this guide presents a clear overview of each species, complete with photos and illustrations, botanical description, preferred habitats, and interesting tidbits on the plant s ecology and cultural use. Species are organized by family, and a quick-reference guide in the front displays flowers and distinctive fruits by color." This is the ultimate field guide to wildflowers of the midwestern tallgrass prairie. This valuable reference enables all prairie enthusiasts to quickly and accurately identify hundreds of tallgrass prairie plants. The book has more than 320 color photographs and precise descriptions of 295 species including habitat/range information. The complete index has scientific and common names. There is a directory of tallgrass prairies that remain in thirteen states. ...is literally the best book in the world. 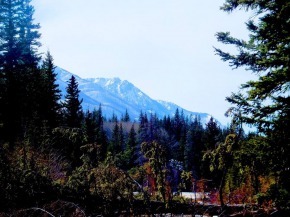 Hikes around Bozeman is literally all you need for a good time in Bozeman, MT. If, "having a good time" for you means acquiring a number of blisters that would impress the Guinness Book of World Records and gaining 1,000 feet per mile (who needs oxygen when you have this view!?). Some of the trailhead roads are a bit out-of-date, as I found out, three miles in, my FWD falling squarely into a pothole the size of my kitchen sink (Grated? Really? Not since the 80s, maybe). But a friendly local traveler usually passes by to help you out in no time. Highly recommend, but in addition to this book, bring an inhaler, bear spray and AWD. When it comes to hiking trails, your average GPS source just will NOT cut it. Google Maps can tell me where the nearest burger joint within three miles of me, open until 1:20AM is, but can't seem to utilize the same technology for those of us who travel on foot through thick foliage, thousands of feet above sea level. The Hiking Project by REI is amazing. They utilize Google's imaging technology but then add hiking trails, with milage, photos and reviews! Now I can plan out my hike before I leave. 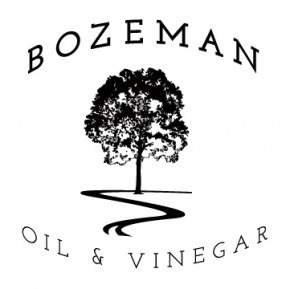 This is the best place to buy custom brands of olive oils and vinegars in Bozeman. The EOS 7D and 7D Mark II are excellent additions to Canon's range of APS-C DSLRs that is, in terms of build quality, speed of operation, ergonomics and image quality, a cut above Canon's previous APS-C flagship, the EOS 50D. 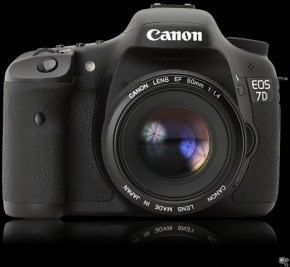 In some respects the 7D is even a better camera than the EOS 5D Mark II and a viable alternative for all those who do not want or need a camera with a full-frame sensor. Its eight frames per second continuous shooting speed and highly flexible AF system might even make it a consideration for credit-crunch battered sports photographers on a budget. 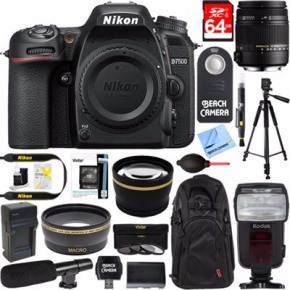 The EOS 7D's specification and current pricing make it also look very good next to its most direct competitor in the enthusiast bracket of the market, the Nikon D300S. It offers a higher nominal resolution and maximum sensitivity, better movie mode specification and slightly faster continuous shooting speed than its Nikon rival; but having said that, in many ways the two cameras are not too dissimilar, and it will be down to personal taste and probably your lens collection if you prefer one over the other. Effective: 20.9 Megapixels -- big enough to comfortably blow up photos to 16 x 20 or larger depending on the quality of the shot. Shoots both JPEG and RAW -- jpeg if you want to go straight from camera to Facebook, RAW if you edit with Photoshop or other software -- RAW gives those programs "more information" to work with. Image stabilization -- yes it has it; great for shooting after three cups of coffee or when birds won't hold still. 100-51200. Nice to have the higher end -- be aware that ISO north of 3200 or so will look like a picture of lint. 8 frames a second when you hold the shutter down while panning with a bird or a Ferrari. It's not the 12 or 14 frames a second of a pro camera, but it's not $6k either. Built in Flash -- for that 95 percentile when you don't have time to clamp a flash in your hot shoe. 4K Video recording at 30 frames a second. Meaningless if you don't shoot much video, pretty important if you do. 30 seconds to 1/8000 of a second. Slow enough to blur a waterfall into silk, fast enough to freeze a hummingbird. Crop Frame Sensor -- important in that you multiply the effective focal length of any lens you buy by 1.5, which means when your lens says, "I'm 100mm" you are actually seeing what would look like a frame from a 150mm lens on a film camera. (some of you may have heard your grandaddy talk about film.) If you get the 18 - 250 mm lens, it's comparable to a 35mm - 375mm lens. Control over the meter system -- you have flexibility in how to set the focal area -- nice for tracking moving subjects at one end and for shooting macro at the other. champagne with glasses, dinner for two, and pool access. However, the resort does not take pets. liked the room, too. It's hard to believe you're in an economy hotel. There's nothing that gets your adrenaline pumping much like a late-night drive across the Continental Divide in mid-November...alone. 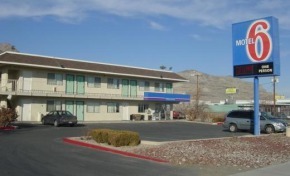 For those who enjoy that sort of thrill-ride, the Chubbuck, ID Motel 6 truly is your port-in-the-storm. There was no greater relief than pulling into their ice-crusted driveway and taking temporary residence in the paper-thin chartreuse walls that enveloped me in their warm embrace. No continental breakfast, but the gas station across the street will provide you with a shrink-wrapped meal for champions...or at least for those who have to drive the span of Nevada before sundown. They do allow dogs, free of charge, but the walls are so thin, she'll keep you up all night from every. Little. Noise. La Quinta in Loveland, Colorado was a great spot to stay because ……. room is bright, clean, and cheerful. The little swimming pool is clean. Something cold before your hike. Happy Isles Ice Cream Stand is literally the greatest thing. It's an ice cream stand. At the trailhead. 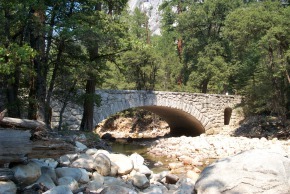 Of the John Muir Trail. Just hiked 14 miles through the backcountry, and what do you want to do while waiting for the shuttle back to your campsite? Devour an ice cream cone. There's no greater thing. The reason I gave it four stars is because I wish it were open longer -- peak summer hours only. Fun place to visit. 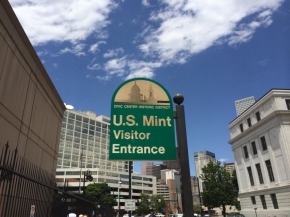 Check to see if they are open to the public as they sometimes have unscheduled closures for security reasons. Pretty, but the cows were NOT friendly. 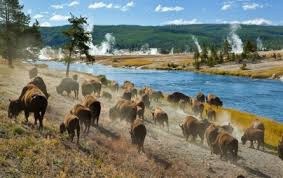 Yellowstone National Park was pretty cool. Rained a lot, even though it was August, which I felt wasn't fair. Had to buy a bunch of new clothes at the gift shop because all I had packed were shorts. I think maybe they should open a freeway through the park, as we were sitting in traffic for a LONG time. They did that in my town and it really helped. People who need to get places should not have to sit in traffic! Also, could not find Half Dome.